Our 21" W x 18" H x 8" D fire-resistant, locking courier bag will protect your documents from theft and fire. Bags guard against fire damage until the contents can be safely retrieved. Laboratory tested to withstand high temperatures typical of fires in automobile or plane crashes. The standard bag is constructed of puncture and tear-resistant shells in 1000 Denier basket-weave gold nylon. Other colors are also available (consult color chart) in 1000 Denier Nylon. The heavyweight vinyl or Armadillo Tuff hide skirt, with 88 gauge vinyl panels and double-stitch seams, increases longevity. Pop-up lock provides maximum security and Velcro flap shields the lock and pick-resistant zipper from heat. The rigid construction and square bottom design simplifies loading and comfort handgrip provides carrying ease. All fire-liner seams are sewn with spun Kevlar thread, keeping content protected during fire. The silica cloth fire material has a melting point of 2,500 degrees. Each bag comes with a 2-½” by 3-½” ID framed card-holder. The padlock included provides maximum security and includes 2 keys; your choice of keyed alike or keyed different. There is also a master keyed choice (with an additional charge of $2.00 for first master key: additional master keys are $3.00.) (Interior dimensions: 19" W x 17" H x 8" D.) Gold bags are available as quick ship item. All other colors run approximately two weeks. (For mixed color orders of less than 10 bags per color a $.25 per bag mixed color fee will be added.) One-color imprint charge: $25.00, but FREE on orders of 20 bags or more. For imprinted bags, click on custom imprint button, then forward desired text in a separate e-mail, or attach a digital file, and send to: orders@usbanksupply.com. Production on this bag runs approximately 10 business days. Our 21" W x 18" H x 8" D fire-resistant, locking courier bag will protect your documents from theft and fire. 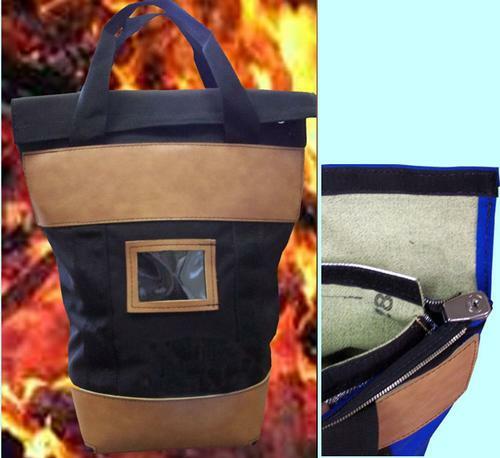 Bags guard against fire damage until the contents can be safely retrieved. Laboratory tested to withstand high temperatures typical of fires in automobile or plane crashes.